Come Visit the M-Joy Store To Purchase Fractal Holograms. Click Here. The 24 M-Joy Fields offer gifts of connection to Fields of limitless love. Connection to these M-Joy Fields of information creates resonance, and resonance creates experience. Contained within these M-Joy Fields are a heart-centered process and language to create and signal resonant field flow, based on principles of holographic fractals, torsion, light, and information. I refer to these M-Joy Fields, and the language to convey them, as Spiralglyphics . Each of the wholly individuated twenty-four Fields affects the toroidal and electromagnetic waveforms that instruct our personal and shared holograms. Simply stated, all twenty-four Fields create clear signals for love as resonant information to express as energy. As a result, we may create, manifest, and experience more coherence, flow, joy, and well-being. The twenty-four Fields are Fractal Holograms. Fractal means that the same basic pattern is repeated on all scales. Hologram means that the whole is represented within all points within a certain system. Thus, each individual Field contains the whole of every other Field, and each Field is a symmetric reflection of each and every other Field. The Fields’ fractal symmetry is not in size or mass but in the ratio of the complex waveforms that give shape to the information that is within each Field. Consider the M-Joy Fields as spherical, standing waves of information, dancing harmoniously together to a musical rhythm of love, expressing light–sound through language. The twenty-four M-Joy Fields support us in establishing resonance with love, unity, and the expression of our inherent boundless potential. These Fields deliver waves of coherent information to clear the distortion and confusion in our personal and shared holograms. Most distortion and confusion have formed as a result of prior conditioning and experiences, which have led us to believe that we are anything other than . . . limitless love. The twenty-four Spiralglyphic Fields offer us new platforms in reality structuring based on the truth of our essence, so we may experience flow, fulfillment, abundance, and empowered joy-filled living. 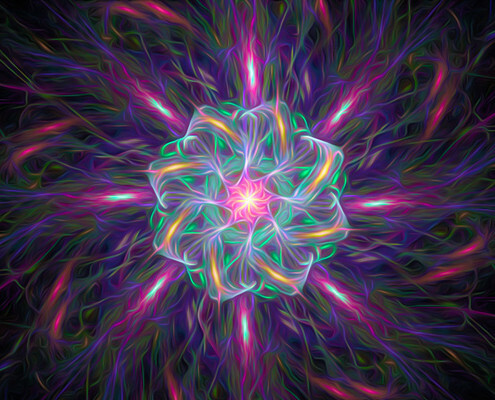 The twenty-four Fields are holographic fractal fields each containing many torsion fields of information creating harmonic resonances of love. This means there is exponential energetic potential available in each Field, providing us with a freedom and flexibility to play within each Field any way we choose. Connection to the information will affect resonance or vibrational frequency. We are free to access the various harmonics of love synchronized within each and every Field. The holographic universe is both informational and vibrational. Everything in the love hologram is light-sound/information/resonance. The twenty-four Fields are holographically encoded through torsion fields that will respond to our signaled intent. There are numerous ways to signal a field flow based on individual intent. It is not important to consciously attempt to match the specific frequency or vibration that corresponds to a particular Field, as intent to connect is what establishes resonance. Again, every Field responds to a signal of intent. Our intention to connect is what activates the flow of the Field. The intention will always be met by a corresponding matching reflection. This means that your intention will be matched by a reciprocal standing wave. Fields are signal based and transfer information in response to a signal sent. Signals of intent are returned through a signal field flow. 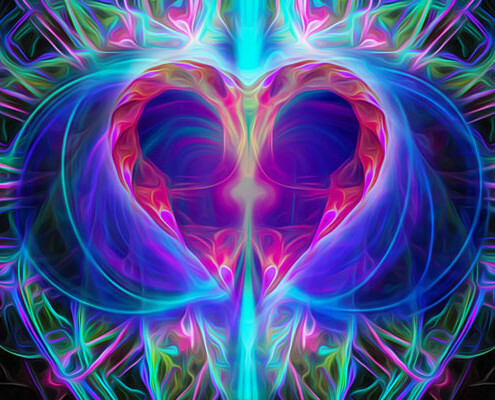 The field of the heart has the ability to access all Fields of love in the hologram. The field of the heart coupled with the intent of the laserlike focus of the holographic mind is what activates the signal for a corresponding Field. The Field in turn reflects back the information that corresponds to the intent. Yes, these Fields will change vibration. Yes, these Fields will create new frequencies for awareness. And these Fields are much more than vibration and frequency combined, for the information inclusive to each Field is exponential in potential. Big potentials can actualize into real experiences. Love Big! As the Fields themselves are not energies but rather are information based torsion fields, we may not necessarily feel them through traditional sensory awareness. In fact, the Fields are invisible to the five human senses. We shall learn in Little Book of Big Potentials that torsion fields are outside of the detectable electromagnetic spectrum. However, interacting with torsion fields has an effect on the electromagnetic spectrum. Though we cannot notice the actual Fields, we can notice and experience the effects of the Fields in myriad ways. A very powerful way to experience these Fields is through their multi-sensorial Fractal Hologram representation. The Fractal Holograms represent the electromagnetic component of the toroidal waveforms. Each unique Fractal Hologram provides an entry-point or personal portal to connect to the corresponding Field for direct experience. Each Fractal Hologram is an invitation to PLAY. How we choose to notice and experience each Field will be unique for everyone, and there is freedom to play in any way you desire! The twenty-four Fields have something special to teach us all. These Fields are special for women, men, and children of all ages, in different, albeit unifying, expressive manners. The Fields comprise both right-handed spin and left-handed spin. The right-handed spin is an inward movement of centripetal forces that are negentropic in nature and are characterized by the sacred feminine essence. This is seen as an inward movement of the torsion fields, while they simultaneously expand outward in an inclusive and reconciling manner. Right-handed spin is associated with receptivity, cohesion, inclusion, integration, and manifestation. The left-handed spinning torsion fields are an outward movement of centrifugal or entropic forces and are characterized by sacred masculine essence. The left-handed spin is associated with deliberate expression, action, ideation, and manifestation. All Fields contain both right-handed and left-handed spin, and none is exclusively of one or the other. All Fields include both, in the same way we are all both. The information inherent in each Field functions in the same manner as holograms. As with the nature of a hologram, if we were to take a portion of the hologram, such as one Field of the twenty-four Fields, all of the information inherent to all of the Fields is embedded in that singular field. The overtones in each Field are the representative information that is most dominant to that particular holographic Field. Overtones are emphasized by field characteristics, as described in Little Book of Big Potentials. Similarly, the undertones are also fundamental to the harmonics each Field creates relative to the information that resonates with the experiencer. All overtones and undertones of each informational Field follow the phi ratio (Golden Mean) of love, unity, and sustainability. Each seemingly separate Field contains all the information of the totality of all combined Fields. They are Fields within Fields within Fields . . . exponential energetic potential! We are like these Fields, as we too are holograms of love. We can freely start anywhere, jump around, and end differently in myriad ways, and we will still be love. Consider that the distinctions provided relative to each of these individuated fields are merely the distinctions made to create a map for navigating more proficiently to an extraordinary life. However, the distinctions are not as separate as we might think they are. The distinctions overlie one another and are all holographically connected. In the same manner that physical, mental, emotional, spiritual, and relational facets of reality are all interconnected and are not mutually exclusive, the Fields themselves are synergistic, symbiotic, interdependent, tessared, and torsioned together. The Fields have been established to respond to individual preference and comfort in connecting to them. Intention to connect to the informational fields of potential is sufficient to activate field flow, enabling us to easily and consistently reconfigure our experiences of interactive reality creation. Experience the 24 M-Joy Fields represented as Fractal Holograms. Open yourself and others to Fractificence, the magnificence of our infinitely fractal nature reflected in the universal hologram. Come join me for a WE experience as together we embody and experience more of who we truly are! Excerpted and Adapted from: Little Book of Big Potentials by Melissa Joy Jonsson – Available Now on Amazon! Fractal Holograms – All 24 Digital Video Downloads with Music Available Now on this site at M-Joy Store! LBOBP Audio Book lovingly narrated by Melissa Joy – Available Now on Audible, I-Tunes, and Amazon!